When silica dust is inhaled into the lungs, the tiny particles are engulfed by macrophages, large phagocytic cells that play a key role in fighting off bacteria and other foreign substances. The cells are unable, however, to digest the dust and the silica kills them. 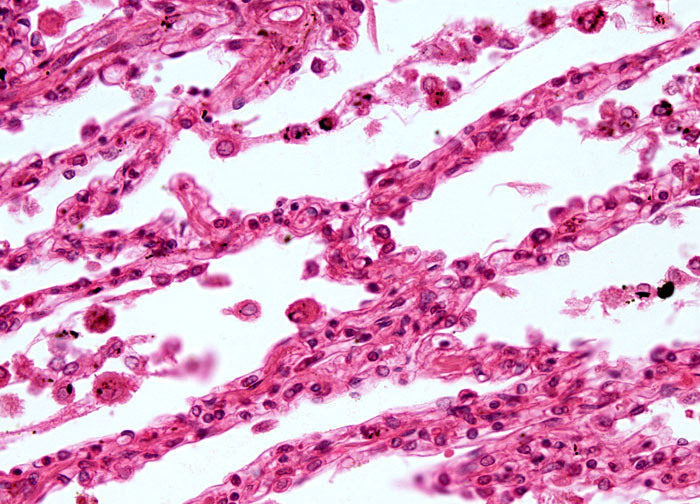 The dead macrophages then slowly accumulate in the lungs so that they eventually form fibrous nodules, which may further coalesce into sizable masses. These fibrous masses, which are characteristic of silicosis, hinder lung expansion and gas exchange. Thus, the primary symptoms of silicosis are breathing difficulty, coughing, chest pain, and general weakness. Silicosis also predisposes the sufferer to a number of other diseases, including tuberculosis, pneumonia, lung cancer, bronchitis, and emphysema.